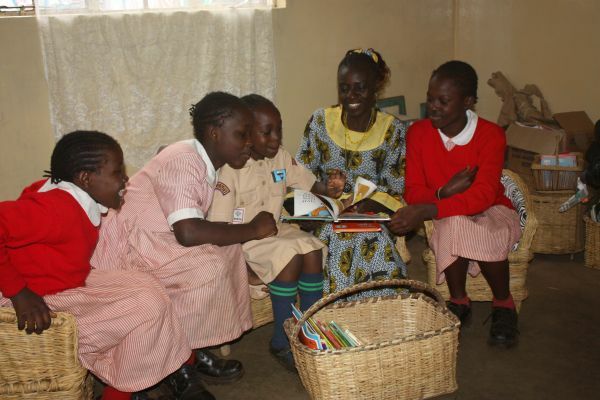 The LitWorld team is creating a BRAND NEW children's library in Kibera, Kenya!!! We bought fruit baskets and little chairs from the side of the road here and heaped them with books; the children are enchanted and so are the teachers! The Girls LitClub members worked hard to help us get this set up for the little ones, but then sat down and enjoyed the books themselves! We will create an upper school library on the next visit. We had a spontaneous new girls club meeting today; girls around kibera and women heard about us being here and especially asked for a meeting with us. 50 women and girls gathered today; they come together every day to play sports, feel good about themselves, and create a community together. Some of the girls and women are in school and some are out of school, many have babies of their own. We sang "A-women" (instead of Amen)!